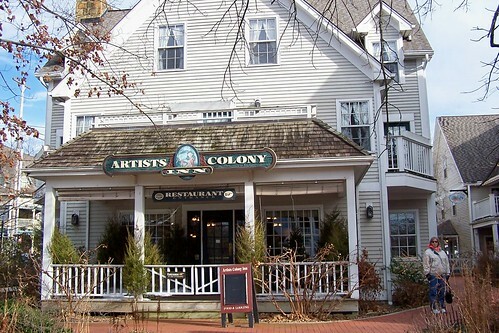 This article is from 2011, for information on upcoming events at Artists Colony Inn, visit here. The Artists Colony Inn of Nashville, Indiana (Brown County) and Artistic Vantage presents their Murder Mystery Dinner Theatre show (the “re” means it’s fancy), Color Me Dead. The art world is atwitter with the emergence of a new artist whose paintings have been attracting the attention of a lot of well- heeled patrons. But when push comes to shove at a “meet and greet” debut dinner, some mysterious things are coming to life. Chaos is the order of the day when the artist turns up dead. The show runs once every month this summer — Saturday, June 11, July 9, and August 13. We’ve already missed the June showing, but there’s still July and August to come. The show and dinner begins at 6:30 pm, and is $40 per person. It includes both the buffet dinner and the show.